One of the more frustrating elements of recent pop music in the UK has been the implementation of faux-regional accents. The reasoning behind the clumsy wrapping of words around heavily-accentuated vocal stylings is myriad – though you could easily pin it on an aping of Arctic Monkeys’ flat Sheffield tones, a sign of a scrabble for regional identity. That said, as broad accents are primarily associated with class, such prevalence of lawks-a-mercy-guv’nor trilling may have a strong correlation with the recent revelatory claim that over 60% of chart pop acts are from a privately-educated background, and the usual British embarrassment derived from privilege. Faux-accents are easy to spot, just as someone pretending to be a rock star can’t hide the truth, no matter how hard they strut on stage. Jon McLeod, aka The Focussed Distraction, has a winsome accent, and it’s a real one, too. How can I tell? Well, I just can. He’s not faking, and you only need to listen to songs like Misery Jukebox to figure that out for yourself. 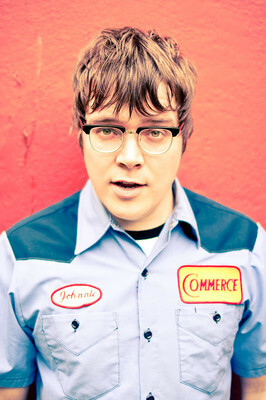 Moreover, it adds a layer of closeness and empathy that may have otherwise been missing from his prickly, outsider-pop. A song named Misery Jukebox was always going to be a bit grumpy, and whilst it is indeed that, the lyrical wit and the contorted, catchy guitar grunt is indicative of a songwriter whose sneer contorts quickly into a wry smile (and then back again). It’s the kind of push-you-away-then-pull-you-close behaviour that, despite ourselves, we all secretly love – and it’ll be the reason for his success too. Posted on February 1, 2011 by Joe Sparrow. This entry was posted in Headline, Today's New Band. Bookmark the permalink.